On right, near back of chair: "Ant[us] Van Dyck fecit"
Agostino Pallavicini, a member of the Genoese branch of the Pallavicini family and the future doge of Genoa, sits enveloped by the sumptuous, flowing red robes worn in his role as ambassador to the pope. The wide expanse of fabric, spectacularly rendered, seems to have a life of its own and almost threatens to take over the painting. The luxurious swirl of cloth, its brilliant sheen, and the way it glimmers and reflects light display Anthony van Dyck's virtuosity as a painter. The family coat of arms seen on the drapery behind the sitter at the left, along with other documented portraits, firmly establishes Pallavicini's identity. In 1621, Van Dyck left Antwerp and traveled to Italy, where he stayed for five years, viewing large private collections of Italian paintings and painting various portraits. This was one of the first paintings he made in Italy, painted in 1621 to commemorate the sitter's service as an ambassador to the newly elected Pope Gregory XV. Agostino Pallavicini, died 1649, by inheritance to Ansaldo Pallavincini. Ansaldo Pallavicini, by inheritance to Anna Maria Pallavicini. Anna Maria Pallavicini, died 1732, by inheritance to Paolo Francesco Doria. Paolo Francesco Doria, died 1732, by inheritance to Maddelena Doria. Maddelena Doria, died 1824, by inheritance to Paolo Francesco Spinola. Paolo Francesco Spinola, died 1824, by inheritance to Giacomo Spinola di Luccoli. Andrew Wilson, sold to Joseph Hawley. Sir Joseph Henry Hawley, third Bart., 1814 - 1875, by inheritance to Henry James Hawley. Source: Painting was in the collection of Sir Henry Hawley in 1879 when it was lent to the Royal Academy exhibiton of that year [Fredericksen, Burton B. Catalogue of the Paintings in the J. Paul Getty Museum (Malibu: J. Paul Getty Museum, 1972, pp. 72-73]. Martin H. Colnaghi, 1821 - 1908 (London, England), sold to Arthur Pemberton Heywood-Lonsdale. Arthur Pemberton Heywood-Lonsdale, died 1897 (Shavington, Shropshire, England), by inheritance to Henry Heywood-Lonsdale, 1897. Lt. Col. Henry Heywood-Lonsdale, died 1930 (Shavington, Shropshire, England), by inheritance to A. Heywood-Lonsdale, 1930. Lt. Col. Arthur Heywood-Lonsdale, 1900 - 1976 (Shavington, Shropshire, England), sold through Thomas Agnew & Sons, Ltd. (London, England) to the J. Paul Getty Museum, 1968. Bellori, Giovanni Pietro. Le vite de' pittori, scultori et architetti moderni (Rome: Mascardi, 1672; repr., Bologna: Arnaldo Forni Editore, 1977), p. 256. Ratti, Carlo Giuseppe. Instruzione di quanto può vedersi di più bello in Genova in pittura, scultura, ed architetura. 2nd ed. (Genoa: I. Gravier, 1780; repr., Bologna: Arnaldo Forni Editore, 1976), p. 140. Cunningham, Allan. The Life of Sir David Wilkie. 3 vols (London: John Murray, 1843), vol. 2, pp. 420, 430, 439, 448-49, 474, 480-82, 494-95. Exhibition of Works by Van Dyck (1599-1641): Winter exhibition, thirty-first year, 1900 (London: W. M. Clowes and Sons, 1900), p. 23, no. 47. Cook, Herbert. "L'exposition Van Dyck à Londres." Gazette des Beaux Arts, 3rd ser., 23 (April 1900), pp. 335, 336. Cust, Lionel. Anthony van Dyck: An Historical Study of His Life and Works (London: George Bell and Sons, 1900), pp. 43-44, 219, no. 47, 244, no. 123, ill. opp. p. 42. Friedländer, Max J. Review of Exhibition of Works by Van Dyck (1599-1641): Winter exhibition, thirty-first year. Royal Academy. Repertorium für Kunstwissenschaft 23 (1900), pp. 168-71. Laban, Ferdinand. "Van Dycks Bildnisse eines genuesischen Senators und seine Frau." Jahrbuch der Königlich Preussischen Kunstsammlungen 22 (1901), p. 204, no. 1. Schaeffer, Emil. "Van Dyck." Klassiker der Kunst 13 (Stuttgart and Leipzig: 1909), p. 518, no. 434, ill.
Burchard, Ludwig. "Genuesischen Frauenbildnisse van Rubens." Jahrbuch der Preussischen Kunstsammlungen 50 (1929), p. 336. Tipping, H. A. English Homes. Period IV, vol. 1. Late Stuart (1649-1714). (London, Offices of Country Life: 1929), p. 203, ill.
Glück, Gustav. Van Dyck: Des Meisters Gemälde; Herausgegeben und enigeleitet von Gustav Glück (Klassiker der Kunst 13). 2nd rev. ed. (New York: Kleinberger, 1931), no. 204, p. 541, repr. Hargreaves-Mawdsley, W.N. A History of Legal Dress in Europe until the End of the Eighteenth Century. (Oxford: Clarendon Press, 1963), p. 10. Finck, Furman. Complete Guide to Portrait Painting (New York: Watson Guptill, 1970), p. 84. Fredericksen, Burton B. Catalogue of the Paintings in the J. Paul Getty Museum (Malibu: J. Paul Getty Museum, 1972), pp. 72-73, no. 87, ill. The J. Paul Getty Collection, exh. cat. (Minneapolis: Minneapolis Institute of Arts, 1972), unpaginated, no. 27, ill.
Fredericksen, Burton B., ed. The J. Paul Getty Museum: Greek and Roman Antiquities, Western European Paintings, French Decorative Arts of the Eighteenth Century (Malibu: J. Paul Getty Museum, 1975), pp. 70, 110-11, ill.
Fredericksen, Burton B., Jiří Frel, and Gillian Wilson. Guidebook: The J. Paul Getty Museum. 4th ed. Sandra Morgan, ed. (Malibu: J. Paul Getty Museum, 1978), pp. 84-85, ill.
Fredericksen, Burton B. Masterpieces of Painting in the J. Paul Getty Museum (Malibu: J. Paul Getty Museum, 1980), unpaginated, no. 29, ill.
Fredericksen, Burton B., Jiří Frel, and Gillian Wilson. The J. Paul Getty Museum Guidebook. 5th ed. (Malibu: J. Paul Getty Museum, 1980), pp. 74-75, ill.
Agnew, Julian. Introduction to A Dealer's Record: Agnew's, 1967-81 (London: Barrie and Jenkins, 1981), pp. 12, 83. Spike, John T. Baroque Portraiture in Italy. exh. cat. (Sarasota: Ringling Museum, 1984-85), p. 213, ill.
Wilson, William. The Los Angeles Times Book of California Museums (New York: Harry N. Abrams, 1984), pp. 175-76, ill.
Barnes, Susan J. "Van Dyck in Italy." Ph.D. diss. (New York University, 1986), vol. 1, pp. 102-3, 228-32, no. 32; vol. 2, ill. 229. Boccardo, Piero. "Per la storia della quadreria di Palazzo Spinola." In Palazzo Spinola a Pellicceria: Due musei una dimora storica. Quaderni della Galleria Nazionale di Palazzo Spinola 10 (Genoa: Tormena, 1987), pp. 62, 66-69, fig. 45. Sborgi, Franco, et al. La Pittura a Genova e in Liguria dal Seicento al primo Novecento (Genoa: Sagep, 1987), p. 292. Larsen, Erik. The Paintings of Anthony van Dyck. 2 vols. (Freren: Luca Verlag, 1988), vol. 2, p. 149, no. 366. Fredericksen, Burton B. Masterpieces of Painting in the J. Paul Getty Museum. Rev. ed. (Malibu: J. Paul Getty Museum, 1988), unpaginated, no. 1, ill.
Larsen, Erik. The Paintings of Anthony van Dyck. 2 vols. (Freren: Luca Verlag, 1988), vol. 1, pp. 170, 220-21, ill.
Gallo, Marzia Cataldi. "Ritratto e costume: status symbol nella Genova del Seicento." Bolletino Ligustico per la Storia e la Cultura Regionale, n.s. 1 (1989), p. 83. Zeri, Federico. Behind the Image: The Art of Reading Paintings. Nina Rootes, trans. (London: William Heinemann Ltd., 1990), pp. 225-26, fig. 9. Cotter, Holland. "Van Dyck: The Subject Transfigured." Art in America 79 (July 1991), pp. 79, 75. Jaffé, Michael. 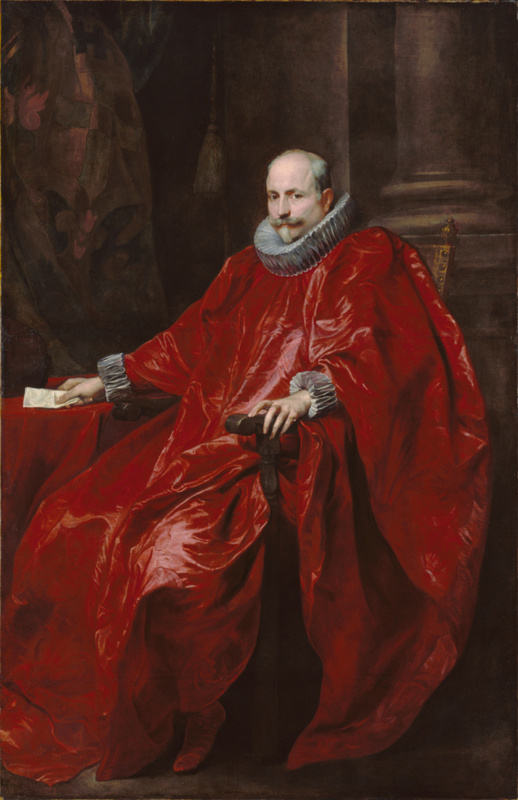 Review of Anthony van Dyck: Paintings in the Grand Manner. National Gallery of Art. Burlington Magazine 133, no. 1055 (February 1991), p. 142. Koch-Hillebrecht, Manfred. Museen in den USA: Gemälde (Munich: Hirmer Verlag, 1992), pp. 277-78. Fredericksen, Burton B., et al. Masterpieces of Painting in the J. Paul Getty Museum. 3rd ed. (Malibu: J. Paul Getty Museum, 1995), unpaginated, no. 21, ill., entry by Burton B. Fredericksen. Fredericksen, Burton B., et al. Masterpieces of the J. Paul Getty Museum: Paintings (Los Angeles: J. Paul Getty Museum, 1997), pp. 52-53, no. 27, ill., entry by Burton B. Fredericksen. Dufour, Francesco, and Marco Franzone, Villa Pallavicino delle Peschiere (Genoa: Tormena, 1999), pp. 18-19, ill. The J. Paul Getty Museum Handbook of the Collections. 6th ed. (Los Angeles: J. Paul Getty Museum, 2001), p. 114, ill.
Sénéchal, Philippe. "Joseph Méry e Paul Lacroix." In Genova e la Francia: Opere, artisti, committenti, collezionisti. Piero Boccardo, Clario Di Fabio, and Philippe Sénéchal, eds. (Milan: Silvana Editoriale, 2003), pp. 270, 275, 281, n. 29, fig. 9. Allen, Denise, et al. Masterpieces of Painting in the J. Paul Getty Museum. Rev. ed. (Los Angeles: J. Paul Getty Museum, with Thames & Hudson, 2003), pp. 48-49, no. 24, entry by Burton B. Fredericksen, ill.
Elliott, Virgil. Traditional Oil Painting: Advanced Techniques and Concepts from the Renaissance to the Present (New York: Watson-Guptill, 2007), pp. 162-63, ill. The J. Paul Getty Museum Handbook of the Collections. 7th ed. (Los Angeles: J. Paul Getty Museum, 2007), p. 109, ill.
Schaefer, Scott. "Bolognese Painters and the Problem of Portraiture." In Captured Emotions: Baroque Painting in Bologna, 1575-1725, exh. cat. Andreas Henning and Scott Schaefer, eds. (Los Angeles: J. Paul Getty Museum, 2008), p. 40, fig. 1. Pointon, Marcia. Brilliant Effects: A Cultural History of Gem Stones and Jewellery (New Haven: Yale University Press, 2009), pp. 54-56, pls. 54, 56. Navarette Prieto, Benito. "Murillo, Neve and the 'Venerables.'" In Murillo & Justino de Neve: The Art of Friendship, exh. cat. Gabriele Finaldi, ed. (Madrid: Museo Nacional del Prado, 2012), p. 75, fig. 37. Khelissa, Anne Perrin. Gênes au XVIIIe siècle: Le décor d'un palais (Paris: CTHS - INHA, 2013), pp. 35, 36, 75, 76, fig. 5.